I’ve eaten the salad 22 out of 22 times at Olive Garden this past three months. I could eat soup. I know that. There are four kinds of soup I could eat. I could cycle them, trade one for another. I know that it would taste fine if I did that. I would like the soup. If not all of them, at least two or three would be fine. Yet I have ordered the salad instead 22 times. Part of this is because 21 out of 22 of my trips has been with Chrissi and James. And sometimes Chrissi has wanted soup, so I get the salad so she can have some of that, too, if she likes. But it’s not just that. It’s like, as long as there is salad on the table, I think whatever else I eat doesn’t matter. Like the shredded lettuce and slivered carrots are going to weave into a stent and prop open my arteries so the flood of salty fat and starch can churn right on through. Perhaps it’s a fool’s hope. The salad is there to make me able to enjoy the pasta, without feeling like I’ve done wrong. But I have done wrong. 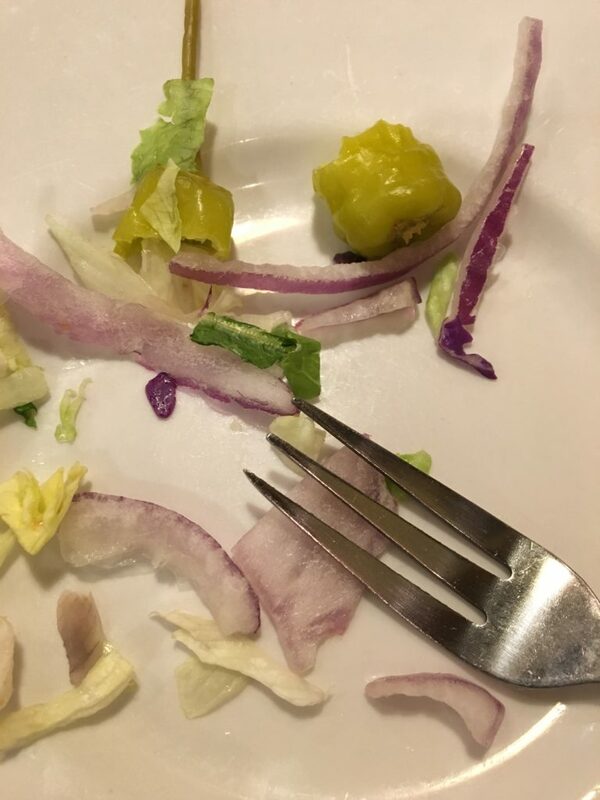 Let’s talk about the salad, though: not even the salad, just the onions. They really like to load up red onions into the salad mix. This is fine, as they do add flavor, but they are some particular strain of Allium cepa. To be completely honest, I think we all know that the onion is a homely flavor vessel. As you can see from this photo, it’s no great loss to leave a few slices on your plate. It’s just an onion. Nobody cares. Nobody’s going to lecture you about the starving orphans in nameless, onion-less Balkan nations. Actually, these last few onion bits aren’t left on the plate carelessly: I leave them on purpose, because my taste buds are all cooked out after a couple of mouthfuls of these red hots. They look so innocuous, but whatever farm The Olive Garden gets its red onions from has to be within at least a hundred miles of hell. I only realized this after about ten trips or so, though, when I finally ordered the salad in its standard form (that is, with Italian dressing lathered on top), as Chrissi wasn’t interested in salad on that occasion. I found out that with the oily dressing coating the vegetables, the red onions are almost completely neutralized. It’s crazy, actually, how much the oil takes away the heat, just sliding it right on down without even letting you know what you’re eating. So that made me realize that most people eating the salad here have no idea what they’re missing. The fire, the belching breath of Satan’s gardeners, is extinguished under a lipid mask. Friends, this was not how things were meant to be. Leave the oil, feel the heat. It’ll all be over soon. This entry was posted in Record and tagged dressing, heat, hot, oil, Olive Garden, onions, red onions, spicy.